This series has been independently translated into Chinese, Russian, Turkish, and Korean, and formatted as an ebook. Are you re-reading this series? Did you see posts 6 (Debugging) and 7 (Revision control) last time? Due to a misconfiguration, they weren’t showing at the end of the series page for some time; this has since been fixed. How is UNIX an IDE? The primary rationale for using an IDE is that it gathers all your tools in the same place, and you can use them in concert with roughly the same user interface paradigm, and without having to exert too much effort to make separate applications cooperate. The reason this becomes especially desirable with GUI applications is because it’s very difficult to make windowed applications speak a common language or work well with each other; aside from cutting and pasting text, they don’t share a common interface. The interesting thing about this problem for shell users is that well-designed and enduring Unix tools already share a common user interface in streams of text and files as persistent objects, otherwise expressed in the axiom “everything’s a file”. Pretty much everything in Unix is built around these two concepts, and it’s this common user interface, coupled with a forty-year history of high-powered tools whose users and developers have especially prized interoperability, that goes a long way to making Unix as powerful as a full-blown IDE. This attitude isn’t the preserve of battle-hardened Unix greybeards; you can see it in another form in the way the modern incarnations of the two grand old text editors Emacs and Vi (GNU Emacs and Vim) have such active communities developing plugins to make them support pretty much any kind of editing task. There are plugins to do pretty much anything you could really want to do in programming in both editors, and any Vim junkie could spout off at least three or four that they feel are “essential”. However, it often becomes apparent to me when reading about these efforts that the developers concerned are trying to make these text editors into IDEs in their own right. There are posts about never needing to leave Vim, or never needing to leave Emacs. But I think that trying to shoehorn Vim or Emacs into becoming something that it’s not isn’t quite thinking about the problem in the right way. Bram Moolenaar, the author of Vim, appears to agree to some extent, as you can see by reading :help design-not. The shell is only ever a Ctrl+Z away, and its mature, highly composable toolset will afford you more power than either editor ever could. EDIT October 2017: New versions of Vim 8.x now include an embedded terminal accessible with the :terminal command. It works a lot better than previous plugin-based attempts to do this. Even with this new feature, I still strongly recommend the approach discussed in these posts instead. In this series of posts, I will be going through six major features of an IDE, and giving examples showing how common tools available in GNU/Linux allow you to use them together with ease. This will by no means be a comprehensive survey, nor are the tools I will demonstrate the only options. I don’t think IDEs are bad; I think they’re brilliant, which is why I’m trying to convince you that Unix can be used as one, or at least thought of as one. I’m also not going to say that Unix is always the best tool for any programming task; it is arguably much better suited for C, C++, Python, Perl, or Shell development than it is for more “industry” languages like Java or C#, especially if writing GUI-heavy applications. In particular, I’m not going to try to convince you to scrap your hard-won Eclipse or Microsoft Visual Studio knowledge for the sometimes esoteric world of the command line. All I want to do is show you what we’re doing on the other side of the fence. This entry is part 1 of 7 in the series Unix as IDE. One prominent feature of an IDE is a built-in system for managing files, both the elementary functions like moving, renaming, and deleting, and ones more specific to development, like compiling and checking syntax. It may also be useful to have operations on sets of files, such as finding files of a certain extension or size, or searching files for specific patterns. In this first article, I’ll explore some useful ways to use tools that will be familiar to most GNU/Linux users for the purposes of working with sets of files in a project. Using ls is probably one of the first commands an administrator will learn for getting a simple list of the contents of the directory. Most administrators will also know about the -a and -l switches, to show all files including dot files and to show more detailed data about files in columns, respectively. -t — List files in order of last modification date, newest first. This is useful for very large directories when you want to get a quick list of the most recent files changed, maybe piped through head or sed 10q. Probably most useful combined with -l. If you want the oldest files, you can add -r to reverse the list. -X — Group files by extension; handy for polyglot code, to group header files and source files separately, or to separate source files from directories or build files. -v — Naturally sort version numbers in filenames. -S — Sort by filesize. -R — List files recursively. This one is good combined with -l and piped through a pager like less. This kind of stuff can even be automated by make with a little work, which I’ll cover in another article later in the series. 1155096    4 drwxr-xr-x   4 tom      tom          4096 Feb 10 09:37 . Note that in this case I have to specify to sort that it should sort by the 11th column of output, the filenames; this is done with the -k option. find . -name '*.c' — Find files with names matching a shell-style pattern. Use -iname for a case-insensitive search. find . -path '*test*' — Find files with paths matching a shell-style pattern. Use -ipath for a case-insensitive search. find . -mtime -5 — Find files edited within the last five days. You can use +5 instead to find files edited before five days ago. find . -newer server.c — Find files more recently modified than server.c. find . -type d — Find directories. For files, use -type f; for symbolic links, use -type l.
Earlier versions of Unix as IDE suggested the use of xargs with find results. In most cases this should not really be necessary, and it’s more robust to handle filenames with whitespace using -exec or a while read -r loop. $ grep -FR someVar . $ grep -iR somevar . $ grep -lR someVar . Some versions of grep include --exclude and --exclude-dir options, which may be tidier. With all this said, there’s a very popular alternative to grep called ack, which excludes this sort of stuff for you by default. It also allows you to use Perl-compatible regular expressions (PCRE), which are a favourite for many programmers. It has a lot of utilities that are generally useful for working with source code, so while there’s nothing wrong with good old grep since you know it will always be there, if you can install ack I highly recommend it. There’s a Debian package called ack-grep, and being a Perl script it’s otherwise very simple to install. Unix purists might be displeased with my even mentioning a relatively new Perl script alternative to classic grep, but I don’t believe that the Unix philosophy or using Unix as an IDE is dependent on sticking to the same classic tools when alternatives with the same spirit that solve new problems are available. As a final tip for this section, I’d suggest learning a bit about pattern matching and brace expansion in Bash, which you can do in my earlier post entitled Bash shell expansion. All of the above make the classic UNIX shell into a pretty powerful means of managing files in programming projects. Edited April 2017 to use POSIX-compatible examples for most of the find(1) invocations. This entry is part 2 of 7 in the series Unix as IDE. The text editor is the core tool for any programmer, which is why choice of editor evokes such tongue-in-cheek zealotry in debate among programmers. Unix is the operating system most strongly linked with two enduring favourites, Emacs and Vi, and their modern versions in GNU Emacs and Vim, two editors with very different editing philosophies but comparable power. Being a Vim heretic myself, here I’ll discuss the indispensable features of Vim for programming, and in particular the use of shell tools called from within Vim to complement the editor’s built-in functionality. Some of the principles discussed here will be applicable to those using Emacs as well, but probably not for underpowered editors like Nano. This will be a very general survey, as Vim’s toolset for programmers is enormous, and it’ll still end up being quite long. I’ll focus on the essentials and the things I feel are most helpful, and try to provide links to articles with a more comprehensive treatment of the topic. Don’t forget that Vim’s :help has surprised many people new to the editor with its high quality and usefulness. Vim has built-in settings to adjust its behaviour, in particular its syntax highlighting, based on the filetype being loaded, which it happily detects and generally does a good job at doing so. In particular, this allows you to set an indenting style conformant with the way a particular language is usually written. This should be one of the first things in your .vimrc file. The colorschemes with a default 16-color terminal are not pretty largely by necessity, but they do the job, and for most languages syntax definition files are available that work very well. There’s a tremendous array of colorschemes available, and it’s not hard to tweak them to suit or even to write your own. 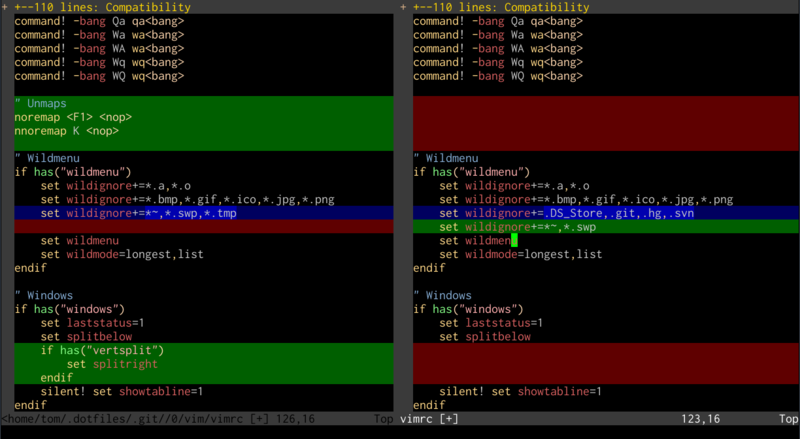 Using a 256-color terminal or gVim will give you more options. Good syntax highlighting files will show you definite syntax errors with a glaring red background. Vim works very well with the output from the ctags utility. This allows you to search quickly for all uses of a particular identifier throughout the project, or to navigate straight to the declaration of a variable from one of its uses, regardless of whether it’s in the same file. For large C projects in multiple files this can save huge amounts of otherwise wasted time, and is probably Vim’s best answer to similar features in mainstream IDEs. The commands :tn and :tp will allow you to iterate through successive uses of the tag elsewhere in the project. The built-in tags functionality for this already covers most of the bases you’ll probably need, but for features such as a tag list window, you could try installing the very popular Taglist plugin. Tim Pope’s Unimpaired plugin also contains a couple of useful relevant mappings. :!<command> — Useful for issuing commands from within a Vim context particularly in cases where you intend to record output in a buffer. :shell — Drop to a shell as a subprocess of Vim. Good for interactive commands. Ctrl-Z — Suspend Vim and issue commands from the shell that called it. Since 2017, Vim 8.x now includes a :terminal command to bring up a terminal emulator buffer in a window. This seems to work better than previous plugin-based attempts at doing this, such as Conque. For the moment I still strongly recommend using one of the older methods, all of which also work in other vi-type editors. :set errorformat+=%m\ at\ %f\ line\ %l\. You may need to install this module first via CPAN, or the Debian package libvi-quickfix-perl. This done, you can type :make after saving the file to check its syntax, and if errors are found, you can open the quicklist window with :copen to inspect the errors, and :cn and :cp to jump to them within the buffer. You can extend this to actually filter text in the buffer through external commands, perhaps selected by a range or visual mode, and replace it with the command’s output. While Vim’s visual block mode is great for working with columnar data, it’s very often helpful to bust out tools like column, cut, sort, or awk. Really any kind of text filter or command can be manipulated like this in Vim, a simple interoperability feature that expands what the editor can do by an order of magnitude. It effectively makes the Vim buffer into a text stream, which is a language that all of these classic tools speak. There is a lot more detail on this in my “Shell from Vi” post. It’s worth noting that for really common operations like sorting and searching, Vim has built-in methods in :sort and :grep, which can be helpful if you’re stuck using Vim on Windows, but don’t have nearly the adaptability of shell calls. Recently a clear winner for Git functionality with Vim has come up with Tim Pope’s Fugitive, which I highly recommend to anyone doing Git development with Vim. There’ll be a more comprehensive treatment of version control’s basis and history in Unix in Part 7 of this series. Part of the reason Vim is thought of as a toy or relic by a lot of programmers used to GUI-based IDEs is its being seen as just a tool for editing files on servers, rather than a very capable editing component for the shell in its own right. Its own built-in features being so composable with external tools on Unix-friendly systems makes it into a text editing powerhouse that sometimes surprises even experienced users. This entry is part 3 of 7 in the series Unix as IDE. There are a lot of tools available for compiling and interpreting code on the Unix platform, and they tend to be used in different ways. However, conceptually many of the steps are the same. Here I’ll discuss compiling C code with gcc from the GNU Compiler Collection, and briefly the use of perl as an example of an interpreter. GCC is a very mature GPL-licensed collection of compilers, perhaps best-known for working with C and C++ programs. Its free software license and near ubiquity on free Unix-like systems like GNU/Linux and BSD has made it enduringly popular for these purposes, though more modern alternatives are available in compilers using the LLVM infrastructure, such as Clang. The frontend binaries for GNU Compiler Collection are best thought of less as a set of complete compilers in their own right, and more as drivers for a set of discrete programming tools, performing parsing, compiling, and linking, among other steps. This means that while you can use GCC with a relatively simple command line to compile straight from C sources to a working binary, you can also inspect in more detail the steps it takes along the way and tweak it accordingly. I won’t be discussing the use of make files here, though you’ll almost certainly be wanting them for any C project of more than one file; that will be discussed in the next article on build automation tools. This will print out the complete code as it would be compiled, with includes and relevant macros applied. 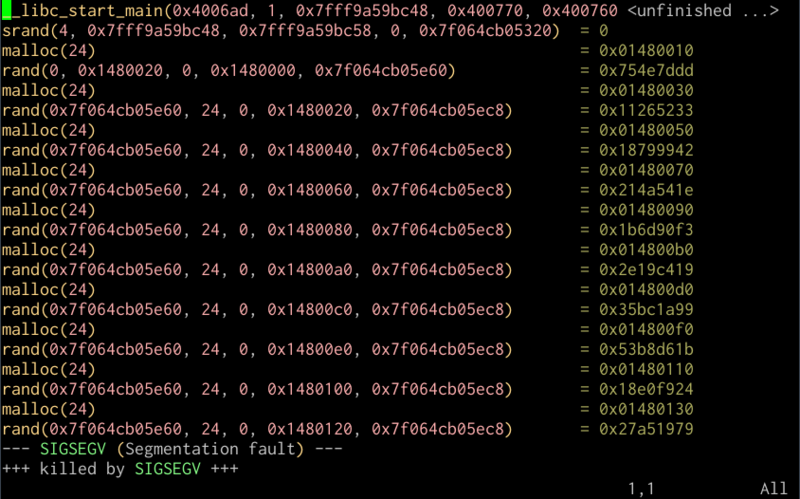 In this example, GCC is not doing much more than abstracting a call to ld, the GNU linker. The command produces an executable binary called example. This is a little simpler, but compiling objects independently turns out to have some practical performance benefits in not recompiling code unnecessarily, which I’ll discuss in the next article. This very common step is another thing that a Makefile is designed to abstract away for you. This is mostly instructive to see what steps the gcc binary is abstracting away for you, but in specific cases it can be useful to identify steps the compiler is taking that you may not necessarily want it to. 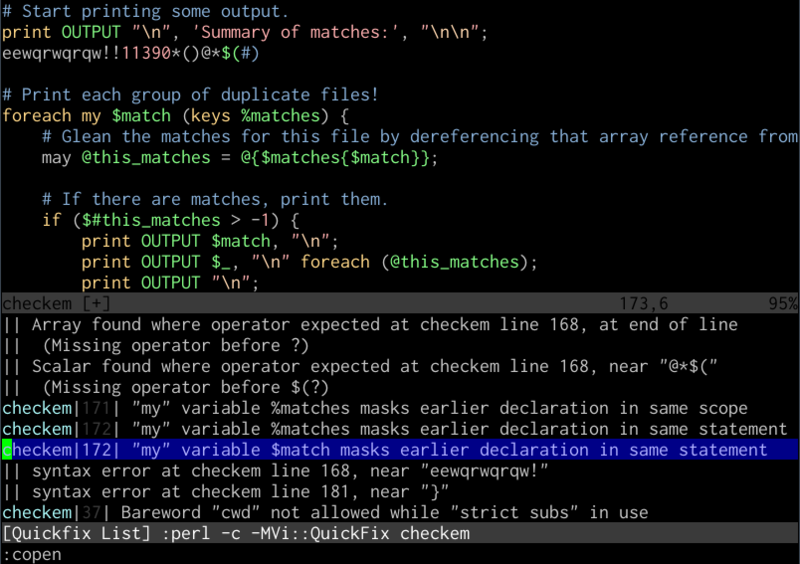 This is good for including in your Makefile or in your makeprg definition in Vim, as it works well with the quickfix window discussed in the previous article and will enable you to write more readable, compatible, and less error-prone code as it warns you more extensively about errors. The approach to interpreted code on Unix-like systems is very different. In these examples I’ll use Perl, but most of these principles will be applicable to interpreted Python or Ruby code, for example. You can run a string of Perl code directly into the interpreter in any one of the following ways, in this case printing the single line “Hello, world.” to the screen, with a linebreak following. The first one is perhaps the tidiest and most standard way to work with Perl; the second uses a heredoc string, and the third a classic Unix shell pipe. But to use the script as a logical binary, so you can invoke it directly without knowing or caring what the script is, you can add a special first line to the file called the “shebang” that does some magic to specify the interpreter through which the file should be run. This works so transparently that many of the common utilities on modern GNU/Linux systems, such as the adduser frontend to useradd, are actually Perl or even Python scripts. In the next post, I’ll describe the use of make for defining and automating building projects in a manner comparable to IDEs, with a nod to newer takes on the same idea with Ruby’s rake. This entry is part 4 of 7 in the series Unix as IDE. Because compiling projects can be such a complicated and repetitive process, a good IDE provides a means to abstract, simplify, and even automate software builds. Unix and its descendents accomplish this process with a Makefile, a prescribed recipe in a standard format for generating executable files from source and object files, taking account of changes to only rebuild what’s necessary to prevent costly recompilation. One interesting thing to note about make is that while it’s generally used for compiled software build automation and has many shortcuts to that effect, it can actually effectively be used for any situation in which it’s required to generate one set of files from another. One possible use is to generate web-friendly optimised graphics from source files for deployment for a website; another use is for generating static HTML pages from code, rather than generating pages on the fly. It’s on the basis of this more flexible understanding of software “building” that modern takes on the tool like Ruby’s rake have become popular, automating the general tasks for producing and installing code and files of all kinds. The general pattern of a Makefile is a list of variables and a list of targets, and the sources and/or objects used to provide them. Targets may not necessarily be linked binaries; they could also constitute actions to perform using the generated files, such as install to instate built files into the system, and clean to remove built files from the source tree. It’s this flexibility of targets that enables make to automate any sort of task relevant to assembling a production build of software; not just the typical parsing, preprocessing, compiling proper and linking steps performed by the compiler, but also running tests (make test), compiling documentation source files into one or more appropriate formats, or automating deployment of code into production systems, for example, uploading to a website via a git push or similar content-tracking method. The above isn’t the most optimal Makefile possible for this project, but it provides a means to build and install a linked binary simply by typing make. Each target definition contains a list of the dependencies required for the command that follows; this means that the definitions can appear in any order, and the call to make will call the relevant commands in the appropriate order. In the interests of automation, however, it’s instructive to think of this a bit more generally than just code compilation and linking. An example could be for a simple web project involving deploying PHP to a live webserver. This is not normally a task people associate with the use of make, but the principles are the same; with the source in place and ready to go, we have certain targets to meet for the build. PHP files don’t require compilation, of course, but web assets often do. An example that will be familiar to web developers is the generation of scaled and optimised raster images from vector source files, for deployment to the web. You keep and version your original source file, and when it comes time to deploy, you generate a web-friendly version of it. With the above done, typing make icons will go through each of the source icons files in a Bash loop, convert them from SVG to PNG using ImageMagick’s convert, and optimise them with pngcrush, to produce images ready for upload. For a more compact and abstract formula for turning a file of one suffix into another, you can use the .SUFFIXES pragma to define these using special symbols. The code for converting icons could look like this; in this case, $< refers to the source file, $* to the filename with no extension, and $@ to the target. A variety of tools exist in the GNU Autotools toolchain for the construction of configure scripts and make files for larger software projects at a higher level, in particular autoconf and automake. The use of these tools allows generating configure scripts and make files covering very large source bases, reducing the necessity of building otherwise extensive makefiles manually, and automating steps taken to ensure the source remains compatible and compilable on a variety of operating systems. Covering this complex process would be a series of posts in its own right, and is out of scope of this survey. Thanks to user samwyse for the .SUFFIXES suggestion in the comments. This entry is part 5 of 7 in the series Unix as IDE.